When it comes to choosing a big game fly reel, nothing’s as important as its drag. That means it must: be smooth, start up easily, have good heat resistance/heat dissipation, and perform flawlessly throughout a broad range of settings with little change – from a mere half-pound to more than six pounds of drag. Since the first big-game fly reels hit the market more than three decades ago, just about every material known to man has been tried as fly reel drag material. Seamaster reels, the first to use a cork drag to whip big fish, worked damned well and still do. However, fly fishermen – being consummate innovators and recognizing the value of new marketing devices – constantly put new drag materials to the test. The list includes asbestos, Teflon, Delrin, rubber/cork composites, oil-impregnated metal washers, and leather, and there are still other materials. So, what does qualify as today’s best material and design for a big game fly reel drag? After years of fly fishing for big game using just about every quality fly reel available and field-testing just about all of the drag materials mentioned above, I’ve personally concluded that pure cork still reigns supreme. But opinions are many and varied. So, I interviewed Steve Abel and Ted Juracsik Sr., two of the world’s top guns in fly reel manufacturing, for their answers to this vital question. DB: So what is the best, proven drag material? Abel: Cork, pure ground up cork bonded with a gelatinous polymer, formed into a flat sheet and stamped out into 1-1/2 to 2-1/2 inch washers, depending upon the reel size. To my knowledge, there’s absolutely nothing else available today which has been proved through long-term field-testing to out-perform pure cork. It is a natural fiber with some of its own lubricants; it compresses which means smooth, constant drag pressure throughout a huge range without erratic startup inertia. The material is not only heat-resistant, it can stand being soaked in water (saltwater) for hours and will still perform flawlessly. I’ve run the cork drag washers I use in my reels on a dynamo at as much as 25 pounds of drag for as long as three hours and they still worked perfectly. I once had a reel returned to me that had been in a fire. Its paint had been charred off, the handle was charcoal, the frame warped, but the cork drag washer – though blackened – still worked perfectly. When I snorkel, I troll a fly for barracuda or jacks or whatever, holding my fly outfit completely underwater! People think I’m nuts, but it’s amazing how many fish I catch. But what’s even more incredible: after three or four hours submerged, the cork drag is still silk-smooth. I once fought a big striped marlin on 8-pound tippet for three hours using an outfit I had earlier in the day used for snorkel-trolling. I never had a single problem with its drag. Now if that’s not asking a drag material to perform above and beyond, I don’t know what is. It’s the test of time in the field that counts with fly reel drags – so far, pure cork scores best, in my experience. DB: Why don’t other materials work as well? Abel: Some do work extremely well for certain ranges of drag pressure, but don’t do well throughout a broader spectrum. Most synthetic materials, while extremely heat-resistant, don’t compress well. Accordingly, start-up drag is high or erratic. And, if a material does compress, it doesn’t return to it original thickness. Under a heavy drag setting, say 50% compression, cork returns to about 75% of original thickness. That’s better than anything else we’ve tried to date. Remember, compression is required to have a smooth, efficient drag throughout a broad range of settings. Harder materials just don’t provide enough latitude. There may be exceptions, but I’m not aware of them – at least when it comes to hard-core field testing. DB: Are there better drag materials available, even if they’re cost-prohibitive? Abel: Dan, if I could find a better drag material than pure cork, regardless of its cost, I’d be using it. I haven’t found it yet, but I’ll keep my eyes open. DB: What about drag design? Abel: There are several types of drag design. For big game, the two most widely-used are draw-bar and hub designs. 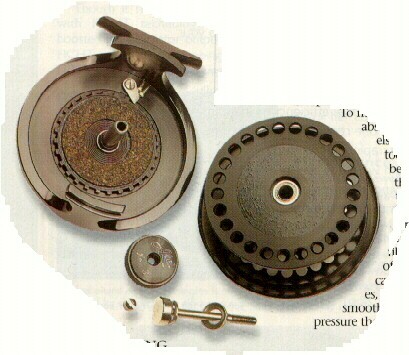 With draw bar and cork, the reel spool is tightened down against a large-diameter cork disk via the drag knob and a spring, providing a huge range of drag settings. The spool may have a heat-dissipating well or sink, which lets heat quickly escape. Hub drags usually consist of a much smaller drag washer made from a variety of materials, sandwiched between two bearing surfaces and slid over a center post, located inside the spool hub. This drag system works like drum brakes on your car, contacting the inside of the spool hub when compressed. Heat can’t escape as easily because it’s contained inside the hub, and the small drag washer just isn’t efficient because it has so little surface area. There is no doubt in my mind that the draw-bar system with pure cork is best! Juracsik: Cork. You sent a tarpon-sized Pate reel back to me for a tune-up some time ago. You hadn’t taken it apart in 10 years and had caught tons of big fish on it. All I did was clean off and replace the dirty drag lubricant. The drag was still perfect because it was made from cork. Nothing yet beats cork. They used to use cork for car clutch lining up until the 50’s on some models; we’re only talking fly-reel drags, here. Heat and start-up inertia are the two greatest enemies of fly reel drags. Lots of materials resist heat but don’t provide low start-up throughout a broad range of settings. Cork does both very well. I’m talking about fairly large, stamped-out sheet cork disks, glued to a gear to which the spool is pressed against. Cork resists heat and compresses, which is why is it so smooth with less start-up inertia. Juracsik: Draw-bar, hands down. Look, draw-bar systems using cork disks provide greater range and heat dissipation than hub drags. Able offers similar advice but suggests using pure Neatsfoot oil to lubricate the drag disk, not a compound which has motor oil added since that will cause the drag to chatter when wet. Able uses a blend of pure Neatsfoot oil and graphite, which can be obtained from the factory. Ted Juracsik compared fine big game reels with fine wine. Makes sense: World-wide, the finest wines use cork for stoppers – the finest reels still do, too.